The library is one of my favorite places in the world. America's library system is a thing of beauty. We have so much wrong with our country, but our library system is a reason to feel to patriotic. Free books. To everyone. It is truly awe inspiring. As a homeschooler on a budget, the library saves us thousands of dollars a year, enabling us to us to study any subject we want, without any added book expenses. While I love the library, it can also be overwhelming. The giant book lists in our curriculum is a pro in my opinion, but it can also become a con if the sheer amount of books overwhelms you, or worse, you start adding up fines. Don't let this amazing tool become a burden in your family! SIGN UP FOR TEXT AND/OR EMAIL ALERTS NOW!!!! Signing up for email alerts & online renewals are the best things I have ever done at my library, it has almost eliminated my fines. I think my total late fees last year were a little over $3. 1.) I go online and RENEW, NO MATTER WHAT. Seriously, renew materials even if you plan to take it back that day! 2.) Put in bag by the front door. Our library as a drive through drop off box, and we drop off the books when we're out and about, and because I have already renewed online, books can be taken back on my own schedule. Almost all libraries now allow you to put books on hold online before visiting the library. Our library has a limit of 10 books for a hold. This can be done on your phone from the convenience of your couch, after your kids go to bed. I pick up the holds at the front of the library, instead of going all the way to the kid's section. When we are busy with life, this can really help you get at least some books in that book basket! This Library Book Basket is where all library books live in our house. They sleep here. 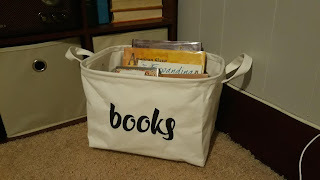 Library Books DO NOT LEAVE the room of the library basket. Period. I wish I could let my kids read all over the house, but the fines are not worth it. The library basket stays in the living room, where I can see it at all times. There are a very few times where I allow my kids to take a book out of the living room, MAYBE in the car on a long trip. But all books must come back to sleep every night in this basket. 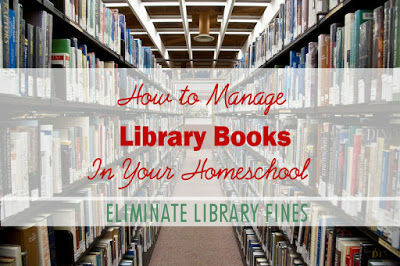 Make your kids responsible for the fines if they lose a book. My boys have paid a lost book fine out of their own money because they lost a book at a park, and it never happened again. They had to split the fine because they couldn't agree on who took it to the park, and who left it there. If you lose a book, of course you as the mom pays for it. But I firmly believe as homeschoolers, they need to learn responsibility of keeping track of their school items, especially if they are older than 2nd grade. A public school child must keep track of their backpack, books, coat, boots, etc. Our kids need to learn to keep track of book inside their own home. With the amount of books we get, it is easy to hurt your back, shoulder, or any part of you that is over 30 years old! I have a lovely rolling cart that lives in the back of my back of my van! I LOVE IT! Every library as an elevator, and this cart gives me an excuse to use it! I keep a few small bags in the cart, so that I can carry the books into my house, but this saves my back from injury. 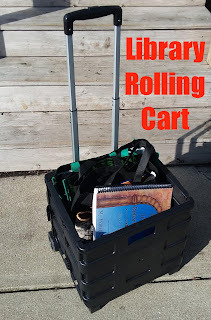 Rolling Library Cart saves my back! I hope this helps someone who is feeling overwhelmed with library books! Remember the library is your friend!